A Select List of Resources for More Livable Communities. Active Living by Design program of the Robert Wood Johnson Foundation, Chapel Hill, NC; www.activelivingbydesign.org. Extensive research bibliography on-line. A coalition of over 50 local and regional pedestrian advocacy groups nationwide, provides technical assistance. Bikes Belong Coalition, Ltd., Brookline, MA: 617-734-2800; www.bikesbelong.org. Coalition of bicycle industry supporters of more livable community efforts. Centers for Disease Control and Prevention. www.cdc.gov/nccdphp/dnpa. A site with tons of current data on health and physical activity, and promotional resources. Complete Streets, Washington, DC; (202) 207-3355, www.completestreets.org, National campaign to have all roads accommodate pedestrians, bicyclists, transit riders, as well as cars. League of American Bicyclists, Washington, DC, 202-822-1333; www.bikeleague.org. National advocacy group advancing the Bike Friendly Communities program. National Center for Bicycling and Walking, Washington, D.C; www.bikewalk.org. 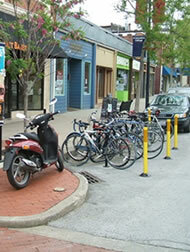 Provides Walkable Community Workshops, technical assistance, Pro Walk/Pro Bike conference. Pedestrian and Bicycle Information Center, Chapel Hill, NC. : 877-WALKBIKE; 202-463-8405; www.walkinginfo.org; www.bicyclinginfo.org. Technical support for communities, including walkability and bike-ability checklists and bike/ped facility design guides. Rails-to-Trails Conservancy, Washington, DC. ; www.railtrails.org. Great help for trail and greenway advocates, including research supporting trails’ benefits. Rivers and Trails Conservation Assistance, a program of the National Park Service; www.ncrc.nps.gov/rtca. Provides technical support. Surface Transportation Policy Project, Washington, D.C. 202-466-2636, www.transact.org. Publishes annual reports loaded with pedestrian activity and safety data. Walkable Communities www.walkable.org The web site of walkable community pioneer and guru, Dan Burden, truly one of the nation’s leading experts on healthy community design.